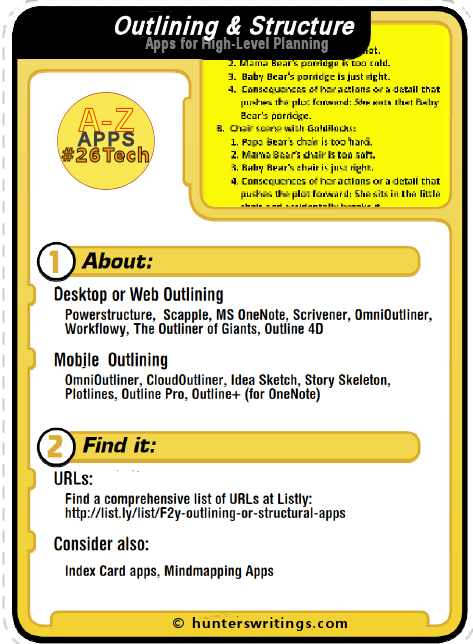 The O post for #26Tech A-Z Challenge profiles some excellent apps for outlining or structuring writing projects. Writers discuss the pros and cons of being a pantser versus plotter a lot. A lot. Personally, the more I write, the more I understand that my own writing process calls for different outlining treatments dependent on the story. Sometimes I am creatively inspired by using brainstorming structural apps (like Scapple, or Mindmapping Apps), sometimes I use linear outliners to try to plan out some starter scenes, sometimes I use cards, sometimes I go in and just start. And this can happen in settings ranging from my desk, while driving somewhere, or sitting in a coffee shop or out on a sports park. I therefore need different tools to capture and play with all the ideas when they present themselves to me. Power Structure is story development and outlining software which comes at a bit of a price. The package contains templated guides to developing your full story structure and characters, with bonus audio training courses also. Templates available are for screenwriting, novels, television and the fictional hero’s journey. There is a demo to download. For a similar price, Outline 4D gives you spreadsheeting to the max. Scenes or events are input into a columnar format, with timeline and element tracking views. Connect and track characters and events, or anything you want. There is a 5 day trial version of the software. The software is supported by a comprehensive Learn Outline 4D website. Website: there is no home website for Outline 4D. You can purchase it from a few writer software catalog stores such as screenplay.com. 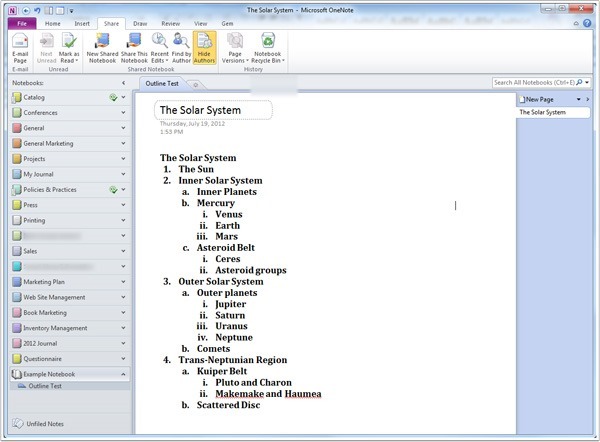 Microsoft’s note-taking package, OneNote, is perfectly setup for outlining and structuring through free-form text, ink handwriting or drawing, and a structured tabbed notebook user interface. 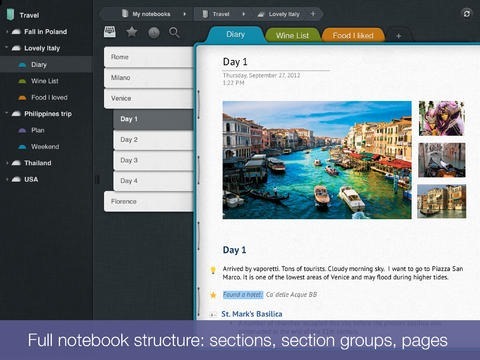 OneNote is discussed more in the previous post – Note-taking Apps. It is also supported with mobile apps, but more specifically – a third party iPAD app called Outliner+ reads OneNote files superbly. 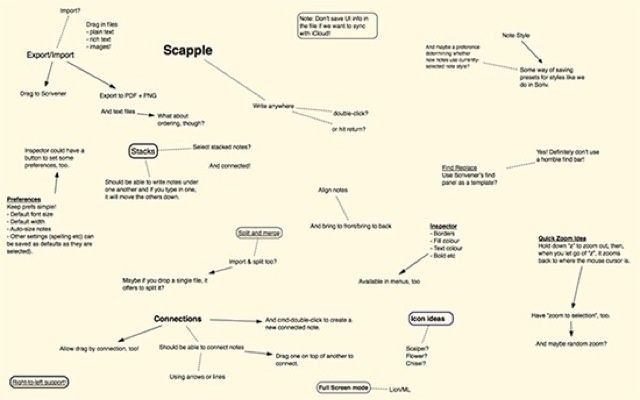 Scapple is now my favourite free-form brainstorming, structural project and mindmapping desktop app. By Literature and Latte, this inexpensive desktop app also is integrated with popular writing app, Scrivener. Of course, Scrivener and many other full-featured writing apps are perfect for outlining and structural work too, because they allow for drag and drop of scenes or text elements and reordering. Scapple was profiled in the #52Tech post of March here. Scrivener (and some alternatives) was profiled in the F post for this #26Tech series. 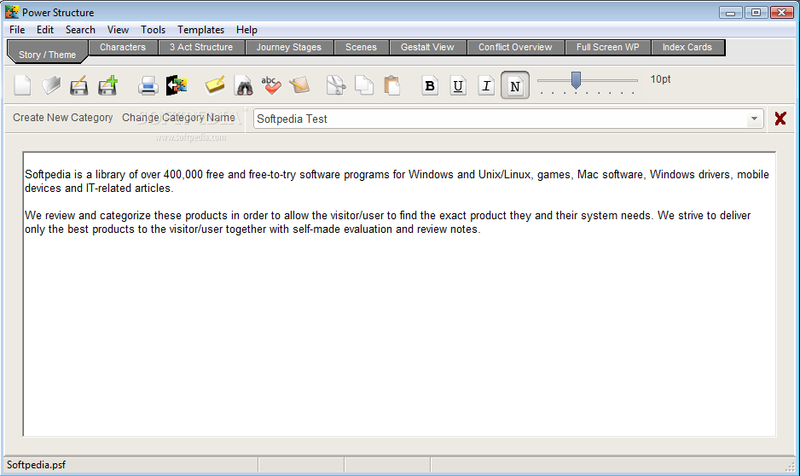 A 30 day trial of Scapple and Scrivener is available before purchase. Website: Literature and Latte: Scapple. OmniOutliner 4 is a popular outliner for Mac OS, now also available through an iPad App (OmniOutliner 2 for iPAD). The two sync data, naturally. OmniOutliner allows you to start off with built-in themes for capturing information, then provides some solid writing editor features. Expand and collapse on multi-branches of text. Workflowy is a free webapp with an iPAD app to take your workflows offline. Note that I actually came across Workflowy backwards – I found the iPAD app before the website. The free service allows for 500 Workflowy items per month – but only the one list. Promoting the site to friends gives you extra, or you can subscribe to Workflowy Pro, for $5 per month. The Pro version have access to unlimited lists, Dropbox backup; and private access for collaboration of the workflow items. Lists collapse and expand, can have hashtags and other markers against items, and items can be crossed out when completed. Although featuring few text editing functions, Workflowy comes good with the offline access available through the iOS apps, or the new desktop app which operates through the Chrome Browser. Designed with researchers and students in mind, users of TOG sign on via their Google account credentials. The free service has some limitations, but still allows for exports as OPML, access through any browser and device with online access, and export into Google Docs. Collapse and expand outline trees. Nodes or outline items support rich text added via textile, markdown support or a rich text editor. Add links via URLs to anywhere – ie. Dropbox files, or Evernote shared notes. Desktop apps are offered through the Chrome browser, or Mac Fluid app. Paid accounts can publish outlines (the free service only supports private outlines). Website: The Outliner of Giants. Outline+ by Gorillized is a fully featured outliner app, but comes into its own for integration with MS OneNote notebooks. Although OneNote does have iOS and Android apps, many people – including me – recommend Outline+ instead. Outline also is available as a Mac App. The app looks much like OneNote with a structured tabbed environment, and listmaking functions. Of course, it syncs across OneDrive with OneNote shared notebooks also. iCloud, Dropbox, Box and Livescribe 3 smartpen support. There is a free version available to trial. Cloud Outliner (iOS and Mac) with Evernote Integration. Cloud Outliner lets you create and share outlines between your Mac and iOS device (iPAD, iPhone or iPod Touch) but the reason I love it is because of the solid integration with Evernote. 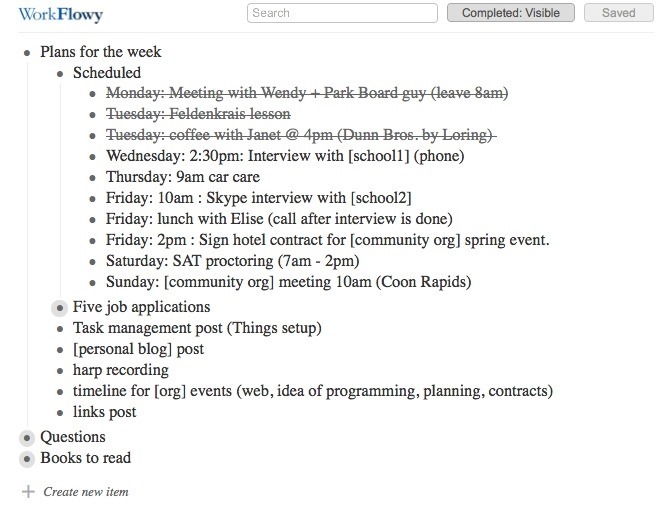 The app creates a notebook inside Evernote for syncing outlines, and this is two-way – changes in one note list are synchronised back and forwards. The outline functions provide for multiple levels, checkboxes and bullet structures, hide lines or sub-categories. I wrote about Cloud Outliner on iPAD in December 2013 – the image you see here is of my outlined Christmas shopping list. Idea Sketch can possibly be considered more of a brainstorming and drawing app. The environment allows you to create diagrams such as mindmaps, concept maps or flow charts – which can be converted to a text outline. Or you can go the other direction – create a text outline and convert to a chart. Ideas can be shared via PDF, Email, Dropbox or OneDrive etc. 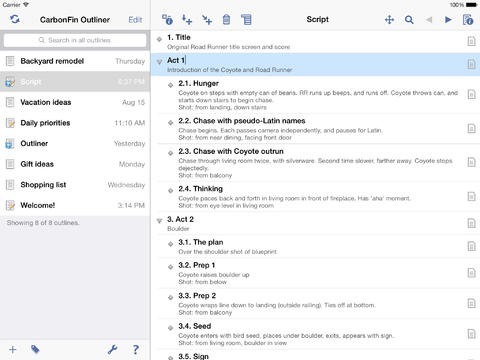 Outline Pro is a comprehensive outliner for the iPAD. 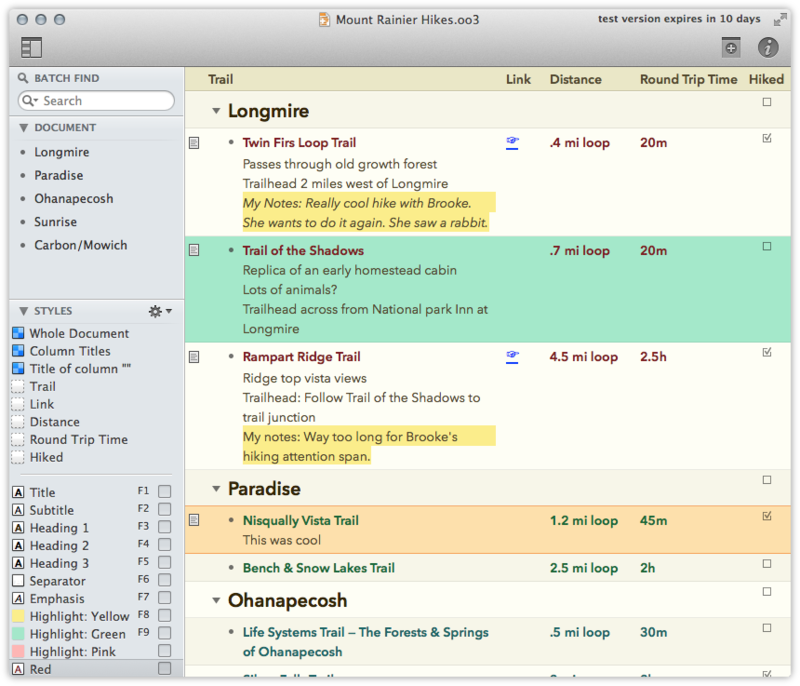 Separate long lists into sections, supports templates, and citation or resource capture. Custom bullet points. Export to your writing apps via text, PDF, OPML or Dropbox, Google Drive or Box. CarbonFin’s Outliner app offers a free online companion for syncing and sharing online storage. The app itself supports multiple projects and lists, collapse and expand list items and Dropbox support. Note: This is not the same as Outliner on Android, although that app looks good also. Plotline was created specifically for writers, and is designed to step through the structure for a story, novel or screenplay. Beginning with a pitch, you later add scenes and rearrange into a three act structure. 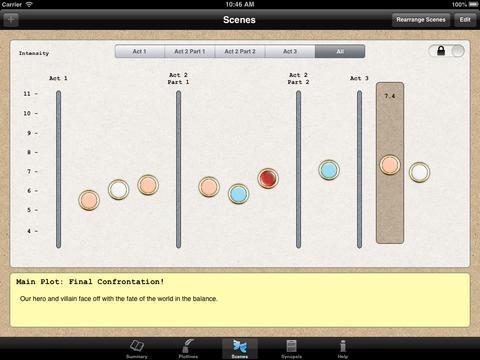 The app also allows you to track the main and sub-plots through a graph. Story Skeleton is similarly focused for the writer, providing prompts in structuring a story into acts and scenes, using an Index Card format. What sets it off is the Scrivener support – Story Skeleton can export and import Scriv files, but only Scrivener Mac users with freeform corkboard, can work fully with these. Story Skeleton was profiled from a Windows perspective in an early post for the #52Tech series. It has also been mentioned in the I post (Index Cards) for this #26Tech series. Many index card apps (featured in the I post of this series) and Mindmapping apps (featured in the M post) should be considered for outlining usage also. Of interest, take a look at Cardboard Index cards for Android, which comes with inbuilt novel structure cards. MagicalPad HD – an interesting app combines freeform workspaces with notebooks, text inputs, drawing, multi-media attachments and linked outlining via mindmapping. With integration to social media, Evernote and exports in the normal formats. Ruminate – a digital whiteboard and mindmapping app for outlining but also with some strong citation or reference collection capabilities. Note: I have not personally tried these unless noted. Aside from Workflowy, the following may be worth contention. Outliner App by Alfred Fritz – looks interesting. Also Outliner Pro. NoteLynx Outliner – with wiki links, night and day themes. #26Tech: This was the O post for my A to Z challenge, where this blog will be posting 26 days worth of Tech posts relevant to writers and creatives. I wanted to concentrate on specific apps which many writers have and continue to use for outlining, and most of my concentration was towards desktop and web apps which are well listed in top ten lists. The apps listed here have all been tested or trialed by myself (aside from the solely Mac ones, although I tested their iOS apps of course). But as I don’t have easy access to Android tablets I didn’t want to add any appropriate apps to the growing list without at least hearing from others. This was a post which fell into the A-Z Blogging Challenge of April, and therefore needed to be as less wordy as possible. There are several apps I’m aware of which have not been listed here, regardless of platform, basically because they are standalone. In looking at apps, I wanted ones which provide some ease of transferring data from desktop or web through to mobile devices. So saying that, I am aware that at the time of initial posting in April, Workflowy had just announced it’s own Android app over the blog. As a current user of Workflowy, I logged onto the interface automatically, which meant that broadcast news like that through a blog just didn’t get circulated in time for this post. There are of course, a few other thought-organiser type outliners in the Android store, and more entering it as time passes. Often mind-mappers, to-do organisers with some listing functions, and short note takers such as Simplenote – will promote outlining as one of the functions of that app. 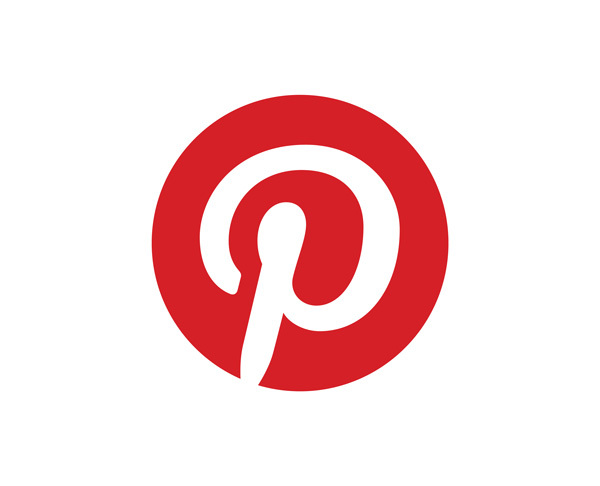 An index carder Android App is mentioned in the post above. I have updated the post with a couple of other Android ones which may be useful. Perhaps Android users can provide some specific others which would work similarly as an outliner to full text editor for writers.